President Mikheil Saakashvili has been taking Sarah Palin’s opinions too seriously. He has written an op-ed column for the WSJ claiming that Georgia was simply defending against Russian aggression this past summer. The question is, rather: What democratic polity would have acted any differently while its citizens were being slaughtered as its sovereign territory was being invaded? South Ossetia and Abkhazia are internationally recognized as part of Georgia, and even some areas within these conflict zones were under Georgian government control before the Russian invasion. We fought to repel a foreign invasion. Just for drill, here’s a timeline of the region’s history, going back to 1801. 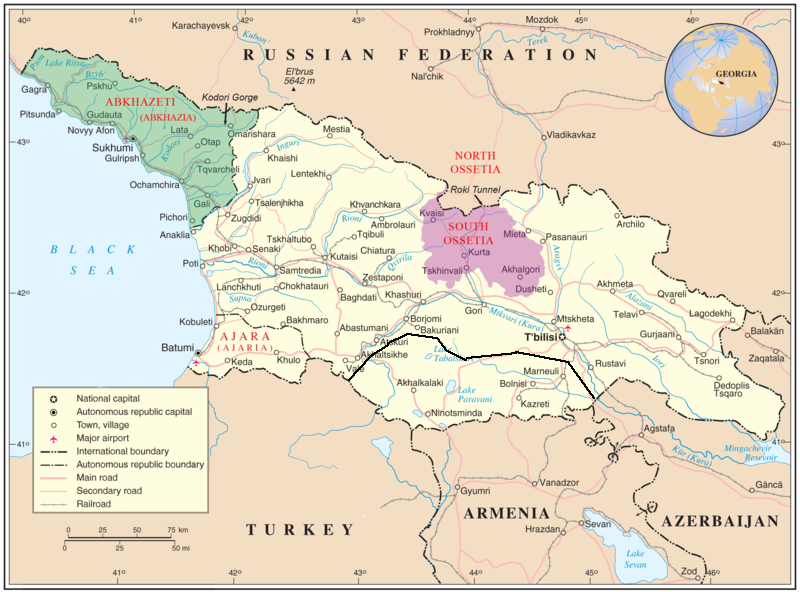 While South Ossetia declared its intention to secede from Georgia in 1990 by holding a referendum–as Georgia declared its independence from the USSR in 1991–Ossetians have been at loggerheads with Georgia at least since the 1920’s. Saakashvili pretends that Russia ignored Georgia’s sovereignty, although the case can be made that the Georgian president did the same to South Ossetians by refusing to allow its people the autonomy they’ve long wanted. Aside from Russia no one in the international community has acknowledged South Ossetia’s claim of independence, but perhaps that has more to do with a fear of Russian hegemony than about supporting a people’s right to form their own government. Besides, if you’re going to refuse Russian incursion anywhere, it should be in Abkhazia which lies next to the Black Sea and would provide a window on the West (a la Peter the Great). South Ossetia would ordinarily prove less important because, even though the Roki Tunnel provides the only transportation across the Caucasus Mountains to the Black Sea, Russia doesn’t need to use the tunnel to get there. It only needed the Roki Tunnel for its attack on Georgia. On the other hand, if Iran were otherwise successfully blockaded as a sanction for developing a nuclear arsenal (that it may not be developing in any case), the Muslim country could ship its oil on the Caspian Sea (yes, there it is!) and transport it over the mountains to the Black Sea via the Roki Tunnel provided Russia had possession of the Tunnel. Let’s pretend then, shall we, that the USA and Europe don’t like the idea of Russia with its petrodollars(!!) helping Iran move oil because controlling the Roki Tunnel and keeping Iran from selling its black gold anywhere in the world–should Ayatollah Khamenei decide nuclear weapons aren’t against his religion after all–is way more fun. You could say the Roki Tunnel serves a strategic interest for the US. It would also explain why the Georgians didn’t blow up the tunnel as the Russians advanced. (The other explanation: Imagine how ticked off Putin would be!) Using the Roki Tunnel rationale doesn’t really work in that way, though. At stake, according to Global Research, are Anglo-American oil companies’ interests in safeguarding methods of transporting energy through the region–and Georgia seems to be receiving NATO aid and training in a quid pro quo as a stand-in for us. Personally, I’m not at all pleased with the idea that the USA would play up the notion of sovereignty for Georgia, which we supported for independence , without doing the same for the people of South Ossetia. I suppose it’s what you’d call Selective Democracy; we get to pick and choose who’s free. For oil, again. Just for the record, Sarah Palin knows nothing about current events. She didn’t know that the US just told Israel that we wouldn’t help them bomb Iran. The US government, under Bush 43, has refused to give Israel the go-ahead to fly over Iraq and has refused to allow Israel to buy refueling tanker planes from Boeing. The US told the Israelis that they can have some fancy radar we’ve developed and we’ve even bought it for them already. Palin didn’t know what the Bush doctrine is. It took her something like three questions from Gibson to figure it out. Palin believes the US energy situation is the cornerstone of foreign policy / national security, the Alaska pipeline being her version of energy independence that will somehow protect the US from Russia and other not-so-friendly countries. Palin believes Iran’s development of a nuclear reactor is a direct nuclear threat to Israel. If Ahmadinejad really plans on wiping Israel from the map militarily he’s going to need cooperation from other countries in terms of safe conduct, fly zones, etc. It is not clear as yet that he could obtain everything he needs. And, in any case, he’s not really the one in charge. The supreme leader, Ayatollah Ali Khamenei, is. Khamenei issued a fatwa against the production and stockpiling of nuclear weapons that was cited by the International Atomic Energy Agency in 2005. I have seen no evidence that this is a false fatwa, such as the one in France in 2005. The Iranians are at an elementary stage in the processing of uranium, not even reaching the point of uranium enrichment, which in turn will take still a number of years, and overcoming many complex technical problems before it can build a bomb. There is no factual basis for arguing that Iran represents a nuclear threat to Israel or to the US forces in the Middle East. Israel has been threatening to bomb Iran because of this perceived nuclear threat since at least 2006, but hasn’t done so. What’s up with that? The only country to benefit from Israel’s bombing of Iran would be Israel, and even that wouldn’t work because it would provoke all-out war against Israel by other countries in the Middle East. Palin doesn’t know what the Cold War was. PALIN: … We are thankful that, under Reagan, we won the Cold War, without a shot fired, also. Without a shot fired? Oh, boy. Thanks. Palin still mentions that her son’s brigade is going to Iraq. I wish she’d shut up about that. If she knows for sure where he’s going, she shouldn’t say anything. But, in general, you don’t know where they’re going. And you keep your mouth shut until you’re told it’s OK to open it. Palin also thinks “God’s plan” for the world has something to do with the right to life, liberty and the pursuit of happiness. I wonder if this means she would intend to spread that around, like Bush 43 did. OMG.